First phase focus on Greater London and prime German city locations. Proven know-how in target markets with extensive experience of key market niches. Bridging the gap in real estate finance. Short-term lending to select European properties against a 1st or 2nd registered title. The fund targets a net return of 8%-10% per year. 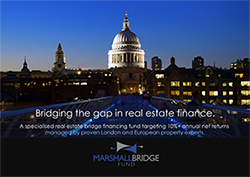 The Marshall Bridging Fund provides development financing in Germany and the UK offering investors an interest margin without the risk of changing valuations. Monthly liquidity, diversification by property type and geographic location are pillars of the strategy applied by our European property experts. Why the Marshall Bridging Fund? Adding value by leveraging a deep understanding of the property sector. The Fund advisors are leveraging their extensive real estate expertise to ensure transparent risk management by adding robust diversification parameters. Marshall Hutton are London and German real estate specialists, whose clients include: Threadneedle, Legal & General, Aberdeen Asset Management (prev Scottish Widows), Royal London, AXA and Hermes. We decided to base the Emerald Diversified FoF in Luxembourg because the advantages offered by this well-established jurisdiction enhanced the benefits we want to pass on to our investors. Our market position as industry insiders provides us unparalleled visibility on lucrative off-market opportunities. Increased demand and lessening supply to the London markets has underpinned values, particularly for prime. Yet, the funding gap remains creating a fractured market, thus generating attractive opportunities. Download our latest monthly performance report! The information provided on this website may include estimates, opinions, forward-looking statements, and unverified statements from third-party sources. This information is being furnished to you solely for your information and personal use and does not constitute an offer or a recommendation to purchase or sell any security. This website is intended to be for information purposes only and it is not intended as promotional material in any respect. Reliance should not be placed on the views and information in these presentations when making individual investment and/or strategic decisions. A fund’s investment objectives, risks, charges and expenses should be considered carefully before investing. This website contains information in summary form only and its accuracy or completeness cannot be guaranteed. No liability is accepted for any loss of whatsoever nature arising from the use of this information. Application for units in this fund may only be made on the basis of a prospectus relating to the fund and this document may only be distributed to those eligible to receive that prospectus. The access to this website may be restricted in certain jurisdictions and it is the responsibility of any person or persons to inform themselves of, and to observe, all applicable laws and regulations of any relevant jurisdictions. The prospectus contains this and other important information about the Fund. To obtain a prospectus free of charge, call SGG Corporate & Fund Administration Services, 412F, Route d’Esch L-2086 Luxembourg . Please read the prospectus carefully before investing or sending money.